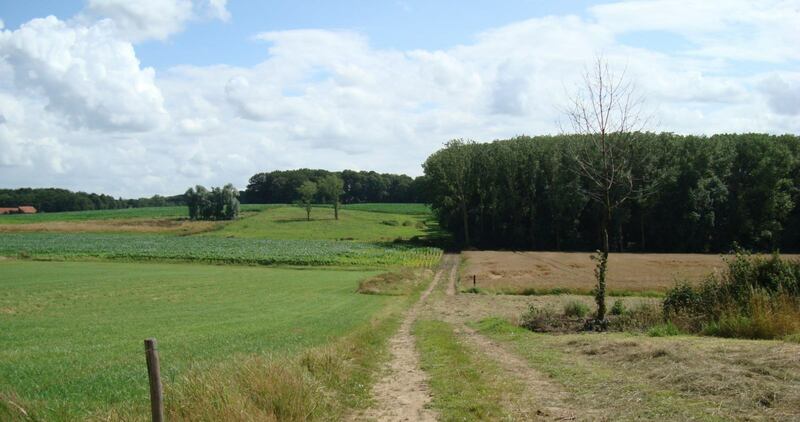 This topic has become a big interest of mine over the last few years, primarily because so many graves were lost after the War in what is now one of the most beautiful areas of Flanders. 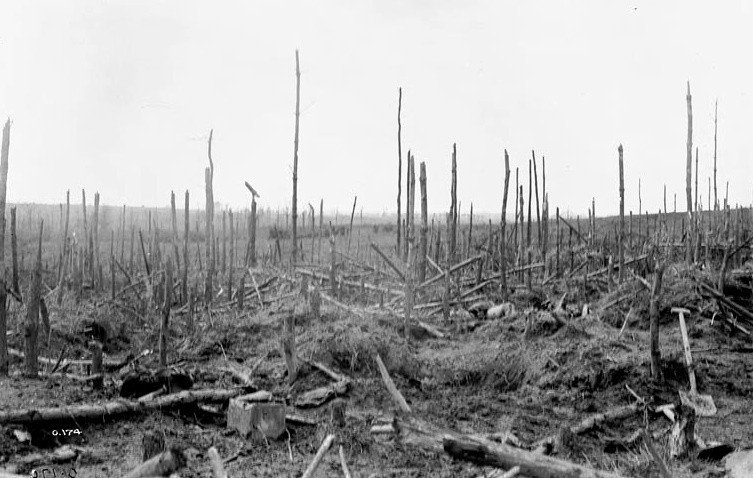 “A view across the obliterated Sanctuary Wood, which after years of bombardment has been reduced to tree stumps. 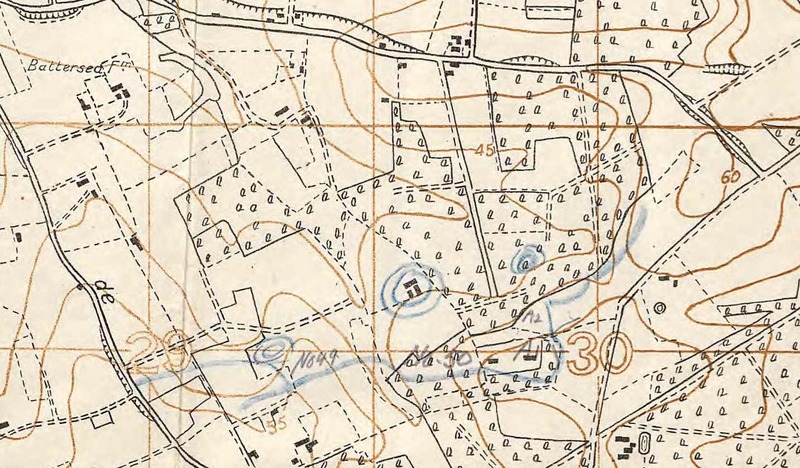 There are flooded shell holes in the foreground and a single cross marking a grave to the right”. Sanctuary Wood May 1920 by Olive Mudie-Cooke © IWM (Art.IWM ART 5407). In contrast to the time that they spent in the front line trenches of the Kemmel Sector, the graves of many of the men that were killed in action ‘in the field’ are now lost and they are either Commemorated on The Menin Gate Memorial or have a special Memorial in Maple Copse Cemetery. 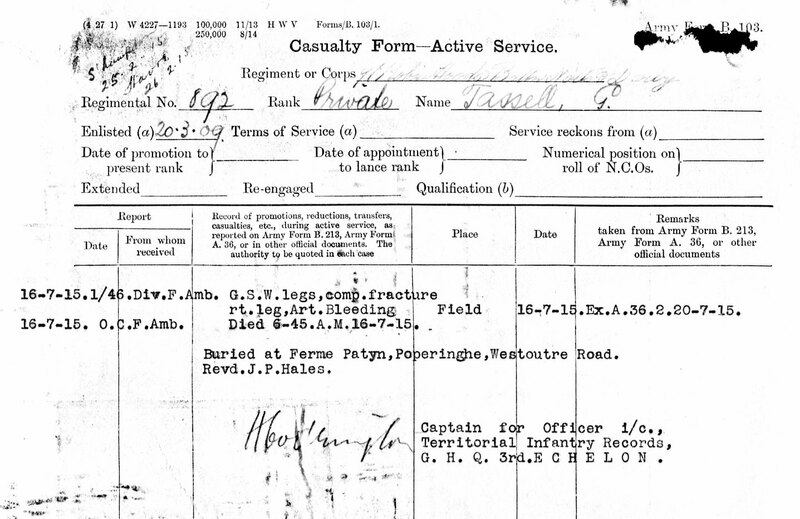 The Army Service Record for 3287 Pte. Tom Bennett of “D” Company who was killed in action on the 28th June 1915 (WO363). He has no known grave and is now commemorated on the Ypres (Menin Gate) Memorial to the Missing; however, at the time of his death Tom was buried in one of several small cemeteries in Armagh Wood that were used for trench burials by the Sherwood Foresters Brigade. 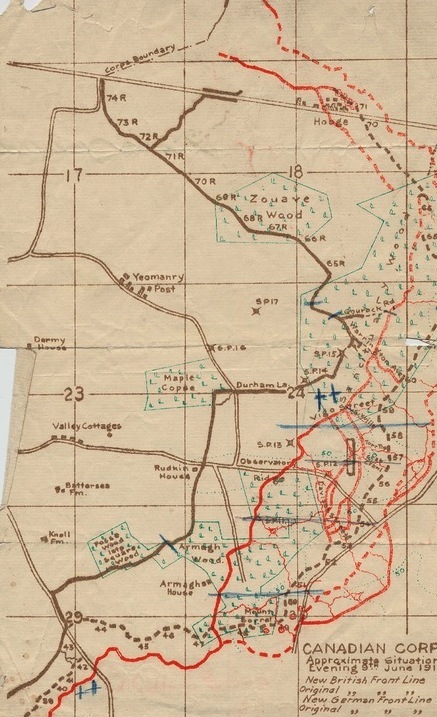 During the 14 weeks that the 139th (Sherwood Foresters) Brigade spent in the Ypres sector, 73 men were killed in action ‘in the field’ and buried in small trench cemeteries in the surrounding woods, only for their graves to be lost by the end of the War. Research undertaken using the Army Service Records of 67 of these men has identified the B103 Casualty Form of Tom Bennett as the only surviving written evidence that some of these graves were located in Armagh Wood. Additional evidence is provided by the War Diary of the 1/7th Battalion Sherwood Foresters (below), which recorded that 2420 Pte. John William Walters and 1280 Pte. Frederick Wilson were buried in Sanctuary Wood and Maple Copse Wood respectively. However, as can also be seen from the War Diary entry there was some confusion as to where 2888 Pte. 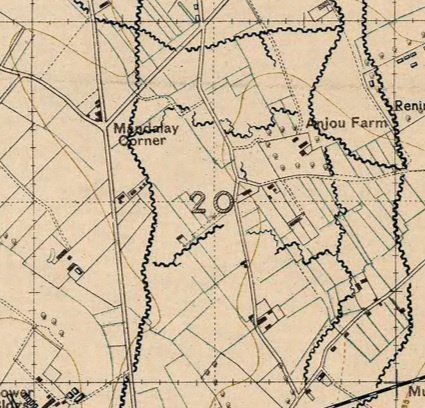 Alfred Blanksby was buried and in fact he was interned in Lijssenthoek Military Cemetery, which was the site of the Casualty Clearing Station. 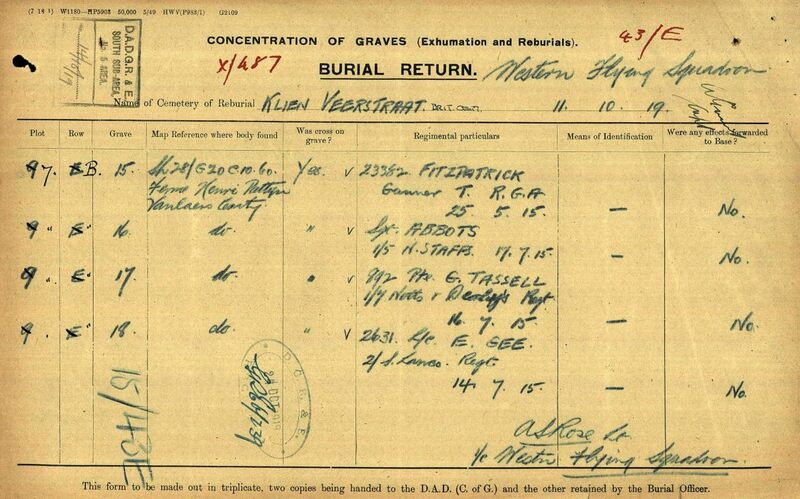 What is also clear from the Army Service Records is that all these men were killed in action ‘in the field’ and that their personal belongings were returned to their next of kin. 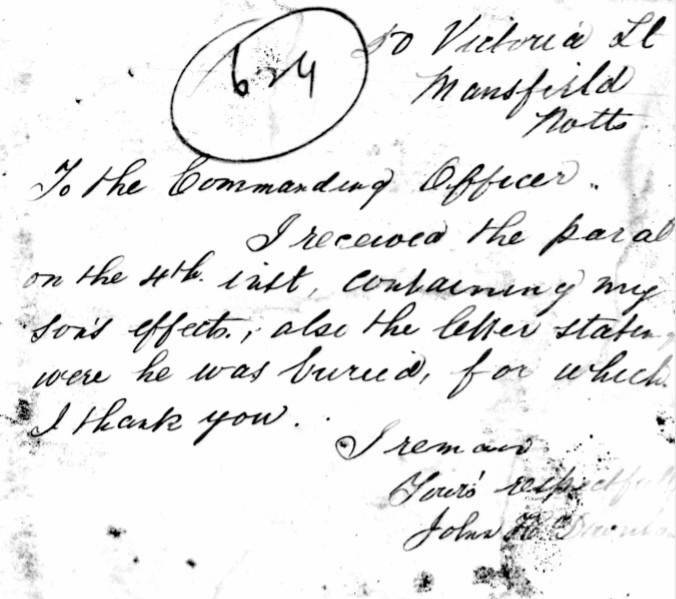 Indeed, the father of 2739 Reginald Downham of the 1/8th Battalion wrote to the Commanding Officer thanking him for the letter stating where his son was buried. Reginald is now commemorated on Ypres (Menin Gate) Memorial. British graves in Maple Copse cemetery east of Zillebeke in the Ypres Salient in 1919. Imperial War Museum (Q 109521). 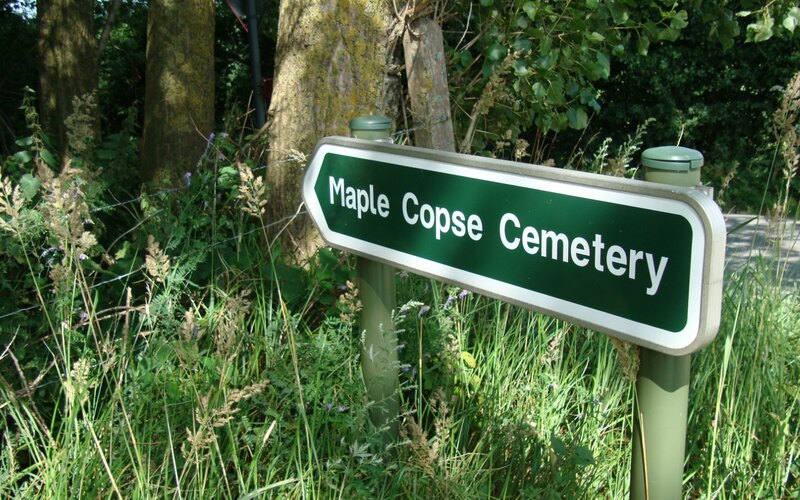 On the 12th of July Private 1563 Harry Depledge of No 7 Platoon “B” Company was killed at duty and buried in Maple Copse Cemetery by Colonel Goodman (above). He was the first man of the 1/6th Battalion to be buried in this little copse. 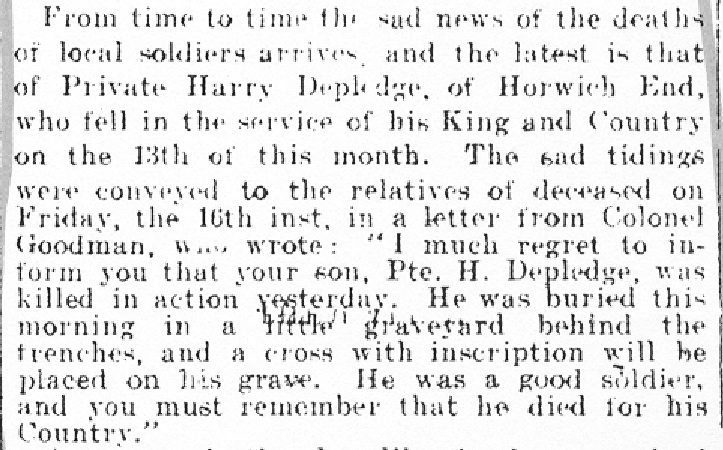 A letter written to the relatives of Harry Depledge by Colonel Goodman records his burial just behind the front line trenches. After the War his grave was lost, like that of six of his comrades, and all of them are now commemorated on special memorials within the grounds of the new cemetery (below). 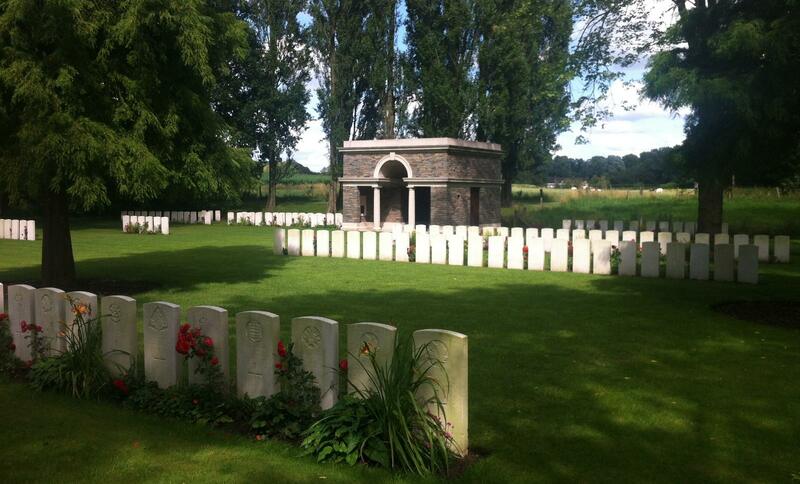 Maple Copse is one of the most beautiful and peaceful cemeteries in the Ypres Salient. 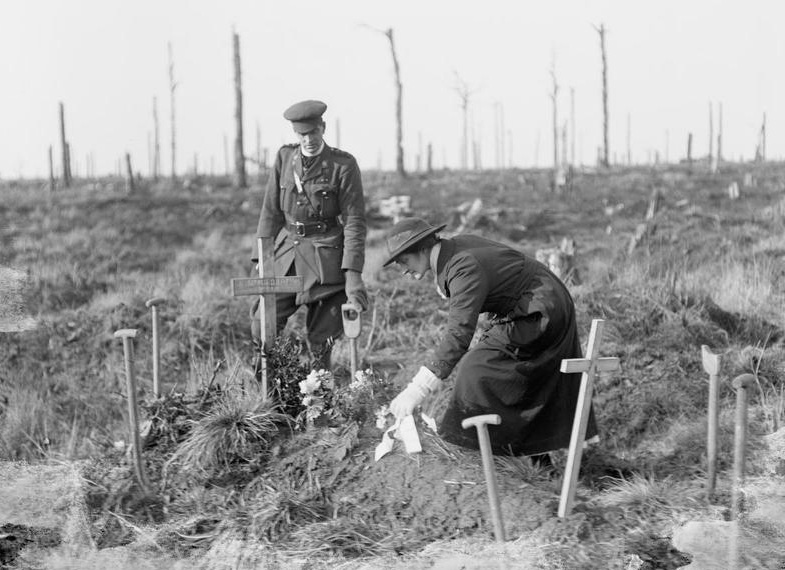 Typical of the scenes from 1918 onwards a South African nurse places a wreath on her brother’s grave at Delville Wood on the Somme battlefield on 17 February 1918. Imperial War Museum © IWM (Q 10677). 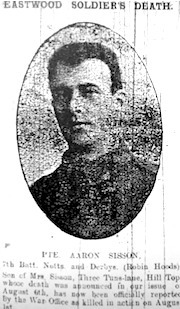 2914 Pte Aaron Sissons was killed in action on 1st August 1915 whilst serving with the 7th (Robin Hoods) Notts and Derby. Like many of his comrades he was buried in a small cemetery just behind the front line and possibly in Sanctuary Wood (which is were his grave is now). After the war it would appear that his grave was lost, however, it would seem from a letter sent to his mother that his body was discovered in July 1923. 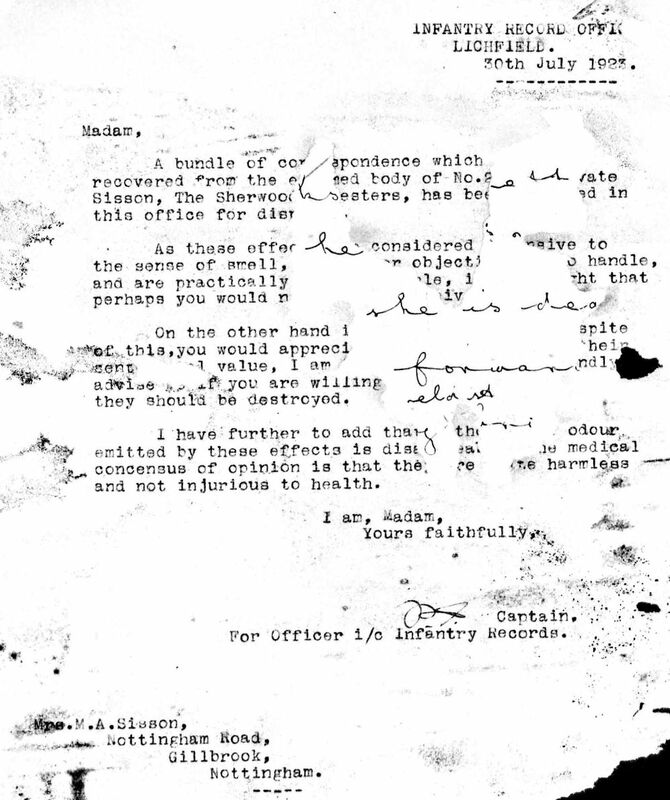 A bundle of correspondence which…………..
and not injurious to health. In the return correspondence Aaron’s brother writes that their mother is now dead and would they send all correspondence to himself. Water damage has stuck these two letters together. 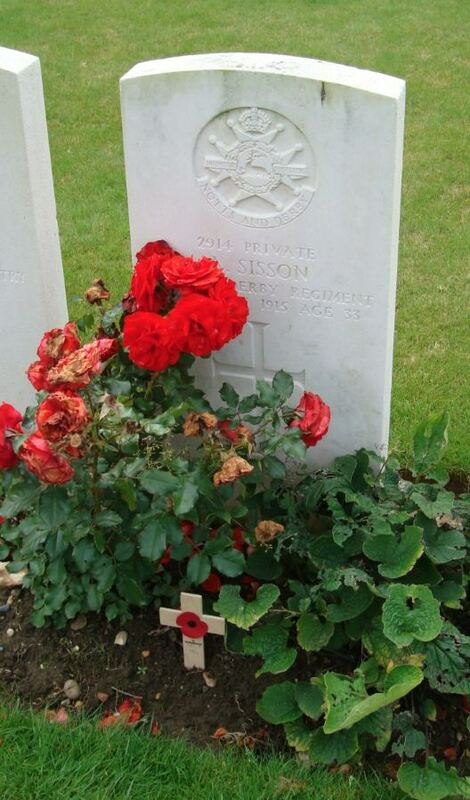 “The second grave of interest here is that of Private Aaron Sissons…… He is the only one of approximately 200 men of the Sherwood Forester…to have died in the trenches of the woods area to have an identifiable grave in its original position”. 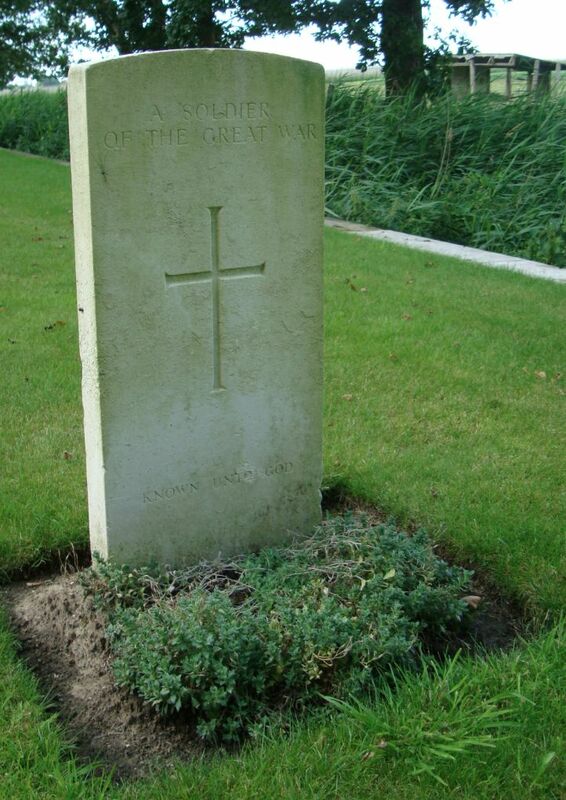 Perhaps this is not the case, it would seem that the presence of these letters on Aaron’s body allowed it to be identified and moved to Sanctuary Wood Cemetery………. Whilst not technically a ‘lost cemetery’ since the bodies of the men buried here were exhumed and reburied at Klein Veerstraat British Cemetery in 1919 it is non the less an important legacy of the 46th North Midland Division. 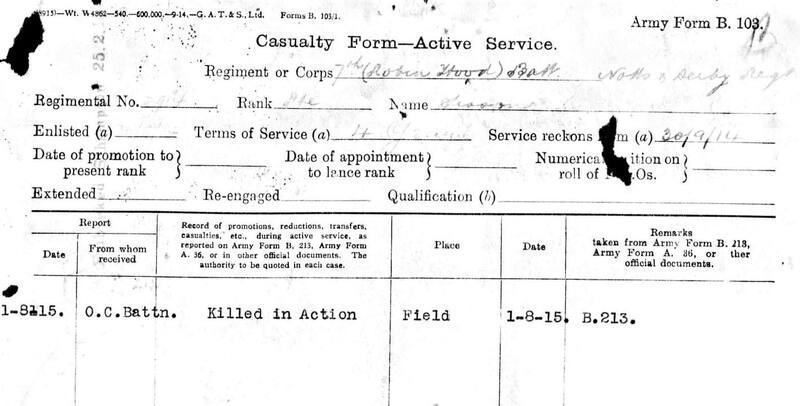 Army Service Record for 892 Private George Tassel of the 1/7th Battalion ‘Robin Hoods’ recording his death at the 1/46th Division Field Ambulance. He was buried at Ferme Patyn on the Westroutre Road by the Reverend J P Hales. Although the fair is not specifically labeled on this 1918 map it is indicated by the cluster of buildings to the left of Westroutre Road.